Hope you all are doing good. Who doesn’t love soft and smooth hair, today am going to review a product that claims to give soft and shiny hair. I love to use herbal hair care products for my hair. I have dry frizzy hair, so the shampoos with huge chemical content will strip my hair moisture. 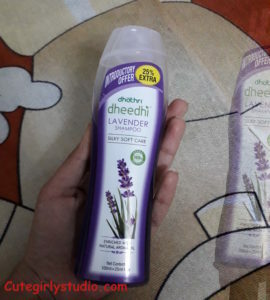 When I ran out of my regular shampoo, I came across this dhathri deedhi lavender shampoo. The shampoo claims to make soft and smooth so without second thought I bought this shampoo. So read more to know about this product. Rs 97 for 100ml. I got 125ml of product as a part of introductory offer. 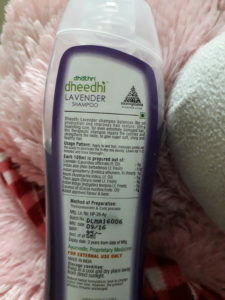 Dheedi lavender shampoo balances the oil production and improves hair texture. Ultra nourishing care, for even extremely damaged hair this therapeutic shampoo repairs the cuticles and strengthens the roots, to give super soft, shiny and healthy hair. It is hard to find this offline (It is easily available only in Kerala). You can buy this from dhathri’s official website here. Now with offer you can buy this for Rs 75 from their website. The shampoo comes in a sleek sturdy bottle. The bottle is travel friendly since the flip flop cap shuts tightly. 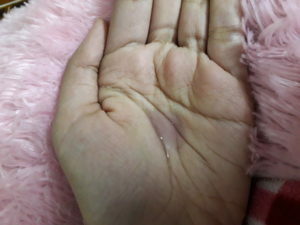 The shampoo is violet in color and it looks great from the bottle. The shampoo is not runny, it is in perfect consistency. The dhathri shampoo has pleasant floral fragrance which is not at all overpowering, even sensitive nosed beauties will like it. The smell lingers for quite some time. The shampoo lathers pretty well and removes oil and dirt in one wash. I always oil my hair before washing my hair and this shampoo does removes it well. 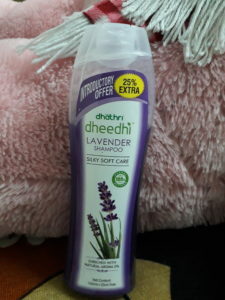 The dhathri shampoo doesn’t lather like chemical shampoos but it lathers decently. Post wash my hair felt soft and smoother as claimed. When I used this for the first time, I didn’t use the conditioner to check how effective the shampoo is. My hair was soft and smooth but my hair was not manageable. Next time I used this shampoo along with my regular conditioner and my hair felt very soft and manageable. So conditioner is a must for girls with dry hair. But after using this shampoo regularly my hair texture is improved. Girls with normal to oily hair can skip conditioner. The shampoo doesn’t claim to control hair fall but it does reduces hair fall with regular usage. If you are looking for a shampoo that improves your hair texture, then try this and definitely you will not be disappointed. Overall this is great for all hair types. Improves hair’s texture with regular usage. Makes hair soft and smooth as claimed. Lathers decently and removes dirt and oil in one wash.
Doesn’t dry out the hair. Girls with dry hair needs conditioner for manageable hair. Doesn’t make hair shiny as claimed. Overall a must try product, who loves to use products with natural ingredients. This is a product that actually works.